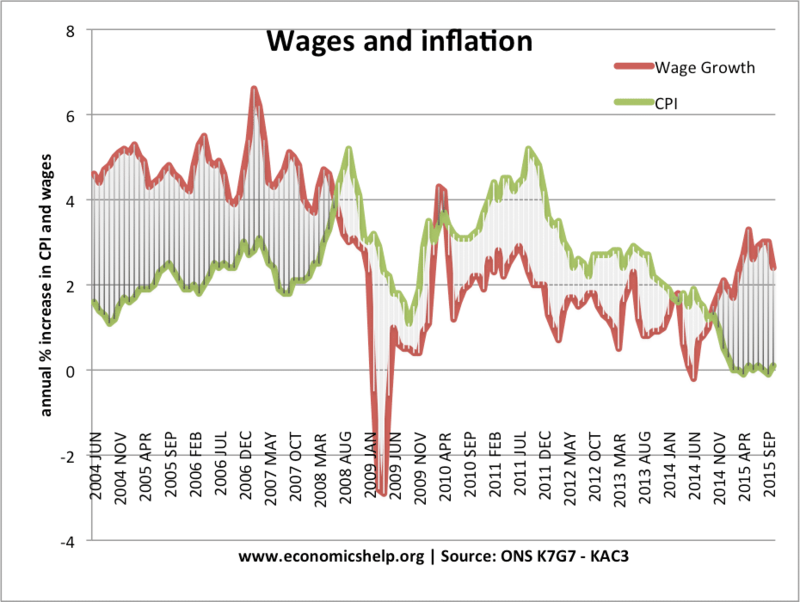 Home > Economics help blog > labour markets > Does real wage inflation help the economy? 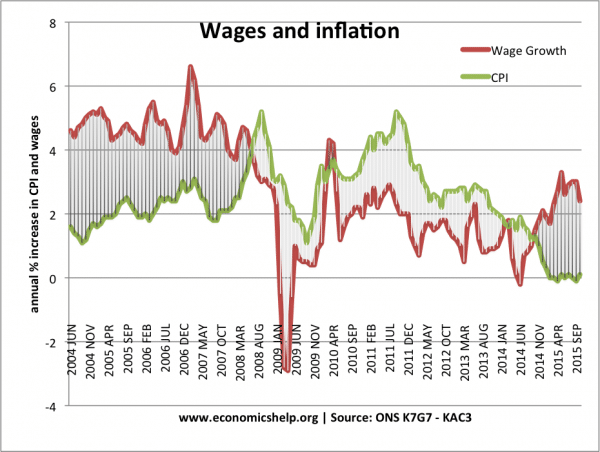 Does real wage inflation help the economy? Rising real wages means an increase in living standards and greater purchasing power of consumers. In the past decade, many economies such as US and UK have witnessed stagnant real wage growth. A rise in real wages would be a welcome boost to living standards. Rising real wage will also enable an improvement in public finances. This is because higher real wages will lead to higher income tax receipts, higher VAT receipts and therefore enable a reduction in government borrowing. Rising real wages imply higher economic growth. Higher economic growth tends to cause rising real wages (though not always). But also rising real wages will lead to increased consumer spending – a major component of aggregate demand and further economic growth. At the current time (2017), UK growth could be curtailed by a fall in real wages (due to cost-push factors of depreciation) In this scenario, a rise in real wages would contribute to higher economic growth. Rising wages and growth may also lead to knock-on impacts of encouraging business investment to meet future demand. Rising real wages usually corresponds to a fall in unemployment (at least demand-deficient unemployment) With positive wage growth and rising spending, it creates more demand in the economy and firms respond by employing more workers. This suggests there can be a relationship between wages and unemployment. The original analysis suggested higher nominal wages leading to lower unemployment. 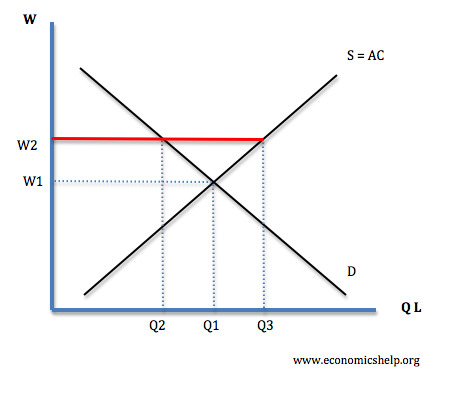 This was later developed to suggest a trade-off between inflation and unemployment. 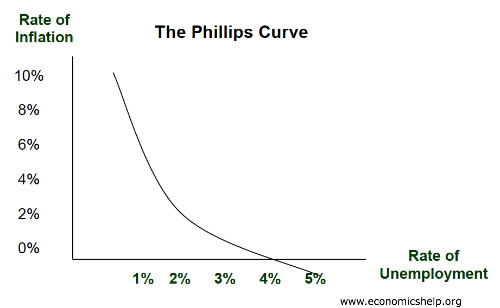 See more on Phillips Curve and cases where the relationship can break down. Real wage unemployment. If real wage inflation is caused by powerful trade unions and collective bargaining. The rise in real wages will increase employment costs for firms. If real wages are pushed above the competitive equilibrium, then we can get a phenomenon of real wage unemployment. In other words, many workers benefit from rising real wages, but some lose out and don’t get a job. It is debatable whether economies like US and UK have a realistic potential for real wage unemployment. In the 1970s, it was an issue – with rising wages partly caused by powerful unions. But, these days, unions are quite weak. If productivity growth is 3% a year (due to improved technology, better management practices, worker enthusiasm). Then a firm can afford to pay real wage increase of 3%. The productivity growth pays for the wage increases. In this case, we can see rising real wages without inflationary pressures. Labour costs are rising, but overall costs are staying the same. This kind of real wage increase is sustainable. However, if productivity growth is stagnant (e.g. 0%) and real wages are rising 2-3%, then firms will be seeing rising costs of production. In this case, we will see inflationary pressures. Also, the countries exports will start to become uncompetitive. In recent years, we have seen poor productivity growth and this is a major reason for low wage growth. Rising real wages which arise from increased productivity are generally beneficial for the economy. They enable higher living standards, increased tax revenue – without potential costs of inflation and uncompetitiveness. Real wage inflation only becomes a problem if it is financed by pushing up prices and diminishing firm profit margins. This kind of real wage inflation tends to be unsustainable and could lead to an inflationary boom and decline in competitiveness. ← Should university education be free? This type cool-aid economic theory does not work anymore. 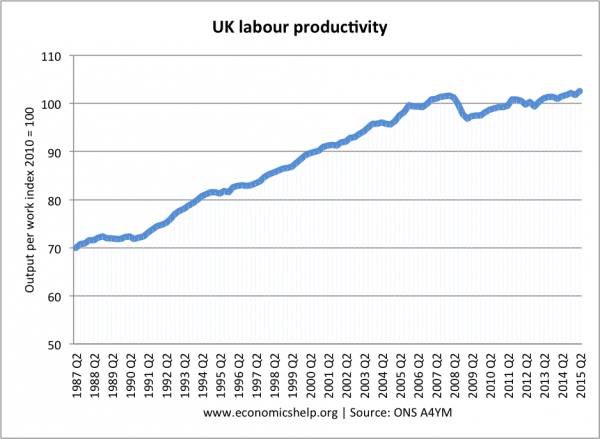 for the last three decades, we’ve seen the productivity increased in the US and UK. In the same time the real wage has not seen substantial improvement. Just go look at around in the major cities and rural America, all you see is a misery, while the number of millionaire’s, and billionaires more than doubles since 1970. This is one of the causes of all the chaos the Western is experiencing right now. Solution are: strengthen worker base or the Union, recognize the gap between technology and the workforce knowledge which need to be narrow through easily accessible training, profit sharing with worker, workers need to have a direct voice and shares at each company’s board of director.